At SkiSling, we've come up with a ski carrier that ensures that carrying your skis is as easy as walking. 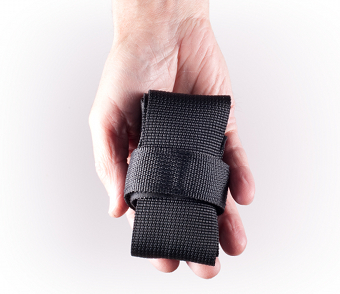 With a ski carrier from SkiSling, both hands are left free, aiding balance and safety in icy, slippery conditions. Carrying your skis and poles using our ski carrier keeps your skis and poles comfortably and firmly on your back; You don't even know they're there! The SkiSling ski carrier comes in two sizes. Whichever size you require, our ski carrier is fully adjustable, and can even fit over small backpacks. Being able to carry your skis easily shouldn't mean that you have to put up with yet more bulky equipment when you've made it to the lifts; So we've made sure that the ski carrier takes up minimal space. Small enough to fit in your jacket or pants pocket while you tear up the slope, you won't even notice it's with you; That is until it's time to make that walk back at the end of the day, when you'll be cool, calm and comfortable, while all those struggling with their skis envy you. An added advantage is that our ski carrier is one piece - there's no bits to lose. Taking just a few seconds to fit to skis, and able to hold your ski poles as well, the SkiSling ski carrier is the last word in ease of use. The benefits for parents skiing with their children are many. Your children can carry their own skis and poles, while you only have to carry yours. We have seen first-hand how much children enjoy using our ski carrier strap, as they feel they are taking a bigger role in the ski trip. 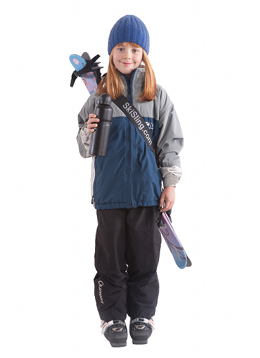 With a small ski carrier, children can carry their own skis and poles. If you are looking for a ski carrier to make your ski trips with your children hassle free, look no further, the SkiSling ski carrier is what you need.